Birthplace of Rivers is a term used to describe that portion of the Allegheny Mountains in eastern West Virginia where many notable rivers source. 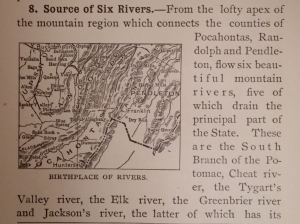 In its most specific sense the term had been employed since the early 1900s to describe the highland area where Randolph, Pocahontas, and Pendleton counties meet. Most of the highest summits in West Virginia are contained within the three counties, and it is here that the waters of the Elk, Cheat, Jackson, Greenbrier, Tygart Valley, and the South Branch of the Potomac arise. The waters of the Cherry, Gauley, Cranberry, Williams, Buckhannon, and Little Kanawha rivers also arise in this highland area though are not generally included among those that source among the very highest peaks. In 2010 the West Virginia Rivers Coalition proposed designating 120,000 acres in the Monongahela National Forest as the Birthplace of Rivers National Monument. The tract would include 50,000 acres in the Cranberry Wilderness area. Please let a member of our editorial staff know if you have information on Birthplace of Rivers or its proposed national monument that we’ve not yet included. If you’ve noted inaccuracies in our content or would like to contribute as a correspondent, let us know.